The 14th Institute of China Electronics Technology Group Corporation (CETC) has successfully developed China’s first quantum radar system last month, Xinhua News Agency reported. The system, which is based on the technology of single photon detection, counts as yet another major milestone for China in quantum research. The quantum radar system was developed by the Intelligent Perception Technology Laboratory of the 14th Institute of CETC. Researchers completed experiments on quantum detection and target scattering characterization. In the target detection experiment, conducted in a real atmospheric environment, the detection ability of the system was proven to be over 100 kilometers. According to a Sept. 8 report by Mingbao Daily, the theoretical basis of the quantum radar is that an object will change its quantum properties after receiving photonic signals. The quantum radar can easily detect stealth aircraft and is highly resistant to becoming jammed. Military experts have stated that once a stealth aircraft is located by the radar, it stands little chance to escape the strikes of air defense missiles. The radar can allegedly detect objects at range of up to 62 miles. A quantum radar device could detect microwave reflections that would normally be swamped by the noisy background radiation. It would contain two devices capable of interconverting visible light with microwaves, a capability that exists with current technology. 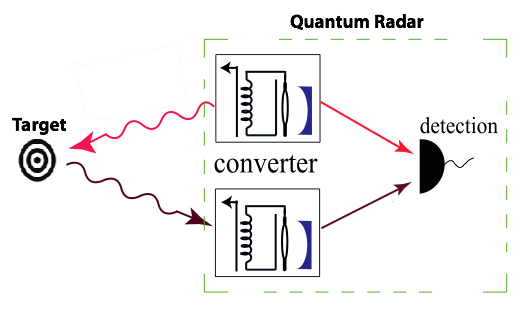 First the top converter couples two entangled beams, a microwave one (red wavy line) and a visible one (red straight line); then the microwave reflection is converted to visible light that interferes with the initial visible beam in the detector. Quantum entanglement scheme previously demonstrated for visible photons into the microwave regime could boost radar performance. Short range radar can detect stealth aircraft but not with very good accuracy Traditional limitation of VHF and UHF-band radars is that their pulse width is long and they have a low pulse repetition frequency [PRF]—which means such systems are poor at accurately determining range. As Mike Pietrucha, a former Air Force an electronic warfare officer who flew on the McDonnell Douglas F-4G Wild Weasel and Boeing F-15E Strike Eagle once described to me, a pulse width of twenty microseconds yields a pulse that is roughly 19,600 ft long—range resolution is half the length of that pulse. That means that range can’t be determined accurately within 10,000 feet. Furthermore, two targets near one another can’t be distinguished as separate contacts. Quantum radar is based on the theory of quantum entanglement and the idea that two different particles can share a relationship with one another to the point that, by studying one particle, you can learn things about the other particle—which could be miles away. These two particles are said to be “entangled”. In quantum radars, a photon is split by a crystal into two entangled photons, a process known as “parametric down-conversion.” The radar splits multiple photons into entangled pairs—and A and a B, so to speak. The radar systems sends one half of the pairs—the As—via microwave beam into the air. The other set, the Bs, remains at the radar base. By studying the photons retained at the radar base, the radar operators can tell what happens to the photons broadcast outward. Did they run into an object? How large was it? How fast was it traveling and in what direction? What does it look like? Quantum radars defeat stealth by using subatomic particles, not radio waves. Subatomic particles don’t care if an object’s shape was designed to reduce a traditional, radio wave-based radar signature. Quantum radar would also ignore traditional radar jamming and spoofing methods such as radio-wave radar jammers and chaff.